Driving is one of the most dangerous things we all do on a regular basis and it has been identified by mining companies as a considerable risk – with many companies indicating it is the number one safety risk both on and off site, writes Mark Butcher. With many thousands of drivers on the road every day driving vehicles that are heavy and often very different from a standard sedan, the risk of an incident or crash occurring is high and the consequences can be deadly. There are many factors that affect road safety in the mining industry and this article will touch on some of the areas that have seen some significant improvements in recent years. Many crashes occur in the mining industry as a result of inexperience on loose road surfaces (gravel and dirt roads), inexperience in handling large vehicles and/or a misunderstanding of vehicle safety systems. Combined with unfamiliar roads, distractions and the long hours worked on most sites – it is easy to see why road safety on site is major concern for companies and is taken very seriously. Companies that address these issues see a reduction in incidents, as well as reduced damage to vehicles and an overall safer work environment for all involved. Well-educated drivers will also be able to make better choices when purchasing their own personal vehicles and understand the safety systems providing a flow on effect that keeps them safe outside of the work environment. Most drivers do not fully understand the safety systems in modern vehicles and are not properly trained to handle a vehicle in an emergency on sealed or unsealed roads. Anti-lock braking systems (ABS) first appeared in 1929 fitted to aircraft, and although using different technology, was demonstrated to shorten brake distances by up to 30 per cent and remove the risk of a skid causing loss of traction, directional stability and damage to tyres. Modern ABS systems can activate on all four wheels with only a small vibration felt when the brakes are applied firmly in an emergency situation. The ABS system releases pressure from the locked wheels allowing them to rotate – providing directional control and improving the braking performance. On gravel or unsealed roads, ABS was less effective in the early days when braking technology was not as refined. Today’s systems are not only effective but often provide a much higher standard of control over cars with no ABS fitted. A vehicle fitted with ABS however will still take longer to stop on gravel and drivers should become familiar with the correct operation of the ABS system so that they can adjust their driving accordingly. ABS has one major advantage and that is that the driver can still steer the vehicle. In many early crashes on mine sites the driver braked hard and swerved to miss an animal or hazard and as the steering remains operational, the car has darted across the road and collided with something on the side of the road or rolled over. It is essential that drivers understand that when attempting to steer to avoid a hazard, there must be enough room to complete the manoeuvre. Often it is safer to stay on the main road and reduce speed as much as possible hopefully avoiding but if not reducing the impact speed with the hazard. The noise and feel of the anti-lock brake system working is foreign to most drivers and should be experienced before a real-life emergency is faced and is something that can be gained from a driver training program. ESC (Electronic Stability Control) or ESP (Electronic Stability Program) is the stability control system now fitted as standard to all new vehicles in Australia. This system relies on inputs from steering and other sensors to provide directional information versus steering input to a computer that can then adjust the vehicle’s brakes as necessary to assist the driver when making a sudden change of direction. A vehicle with stability control cannot go sideways and will actually steer straight ahead if certain parameters are met to avoid any impact to the side of the vehicle. Understanding how stability control works is essential to keeping drivers safe. It is a safety net and should not ever be relied on. 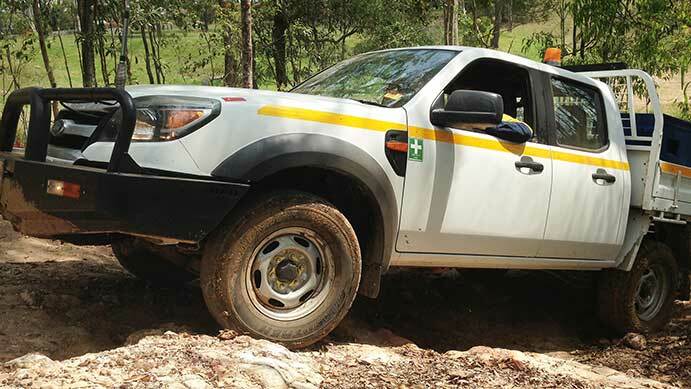 Stability control on mine vehicles is now standard and provides an extra level of safety for drivers operating on loose or unsealed roads, however it can be intrusive – especially when operating off road. Stability can impact the performance of a vehicle when operating in 4WD. When drivers select high range 4WD, stability control remains active on most vehicles and this can create problems when negotiating terrain or slippery surfaces. It is advised whenever a challenging terrain is encountered that you select low range 4WD and this will automatically disengage the stability control system – allowing the vehicle to slide around a bit as it finds its way around tricky or steep terrain. Alternatively, you can use the stability control button to temporarily change the sensitivity of the stability control to negotiate terrain where some slip angle is required. Make sure that the stability control is engaged again before heading back onto normal roads. Fleet selection has become another area that mining companies can make significant safety gains. Today there is a large range of SUV and 4WD vehicles available from a variety of manufacturers. Often a smaller, lighter vehicle is more suited for tasks providing better fuel efficiency and comfort for drivers. Larger vehicles are suited for more extreme environments and for carrying larger payloads. With turbocharged diesels becoming more standard across fleets, it is important to keep the maintenance up to avoid costly damage, especially in dusty or wet conditions. Any excessive contamination in the air intake system can damage vehicles and cause a range of problems. Seating configurations in recent times have reflected a forward step in passenger safety as more fleets move away from the traditional side on seating in cattle trucks. Passengers should be seated facing forwards and have a three-point seat belt for maximum safety. Roll over protection systems (ROPS) have also become commonplace in mine vehicles providing an increased level of protection and safety for the occupants in a rollover or tip-over crash. It is recommended that all vehicles be fitted with these if operating at high speeds on gravel roads. Further safety gains can be had by sites that create safe roads with effective signage and appropriate speed limits. Regular access roads should be well-maintained and monitored to ensure ongoing safety of all road users. Off road tracks should be surveyed and any considerable risk should be addressed using the sites appropriate risk management procedure. Where possible, tracks may be modified or repaired to assist in the safe passage of vehicles. Once suitable vehicles have been selected and the site access and roads are safe, the final and most important step is to educate the driver. Over the years driver training has been delivered by a number of individuals, small companies and even in-house by some companies. With very little experience and research often the training was irrelevant, unrecognised by other sites and in some cases the content delivered would be considered as incorrect and even possibly dangerous. Like any education, the trainer and the content need to work together to be effective. Effective training will deliver the best outcomes and return on investment and, in this case, may well save lives. Driver training is the only way to keep drivers and passengers safe. The standard licensing system does not provide training for gravel roads or 4WD vehicles and does not include any evasive or emergency vehicle control. Driving in rural areas increases the chance of an encounter with wildlife, heavy machines and most drivers are not equipped to handle a vehicle when in these situations. When selecting a training provider it is essential to have a course that is catered specifically for your working environment. The type of vehicles,driving conditions and expected hazards combined with each driver’s experience level should be a part of this process. Training should be conducted on-site if possible and in the vehicles that the drivers will be using. The use of skid-cars and simulators is okay, but can lead to overconfidence and the development of skills that don’t apply to the real world environment. Driver training typically has had a mixed history but with nationally recognised training now available, companies can select a program that includes these units providing consistency and industry recognition for any training completed. When looking at the safety of your employees it is essential that you consider the risks associated with driving both on and off site and what steps can be taken to help keep them safe. Mark has an extensive background in driving which includes competing at World Championship level as a rally driver, driving and instructing in large haul trucks underground, and training the Australian Defence Force. Mark is the managing director of Performance Driving Australia (PDA), and he has designed and delivered driver training programs in Australia and overseas for 20 years. He has delivered training for all the major mining, oil and gas providers, as well as many large corporations and government departments.